As a Family owned and operated business, we know that customer service and quality products are important. We enjoy working with our customers to help them select the right material and the right quantities for their project needs. Our lumber can be found gracing homes, gardens, fences and more thorough out the country and even as far away as Canada, China and South Africa. You wont find a better product with our unmatched customer service anywhere else. John is a retired homebuilder from Northern Wisconsin. John started North Twin Builders in 1971 and successfully ran the home construction company until he sold it in 2002 to his oldest son, John Volkmann Jr. After selling the company, he moved to Mulberry Arkansas with his wife, Renee Volkmann. After a brief period of retirement, they decided to start White Valley Lumber Mill. The cedar mill began with one diesel mill and a crew of three guys and has grown to where it is today - two electric computerized Wood-Mizer LT70 Head Saws and two resaws, including a four head resaw, and a crew of twelve people. John runs the head saw, crew and makes most of the deliveries. As Renee says, “he is the brain and brawn of the whole operation”. In the brief moments that he is not working, he enjoys kayaking, metal detecting, bike riding and horseback riding. Renee is from the Upper Peninsula of Michigan, more accurately the Keweenaw Peninsula. Shortly after marrying John, they headed south to Arkansas to enjoy the warm weather and winters without all that snow. Renee is the top sales person for White Valley Lumber, and when she isn’t making a lumber sale, you can find her in the yard scaling logs, loading the wood decks, working green chain or cutting pickets. Renee is a talented artist who can carve animals with her chainsaw, hand carves custom mantels and doors, along with painting signs and landscapes. When she isn’t creating a work of art, she can be found in the garden or out metal detecting, kayaking, bike riding and horse back riding. 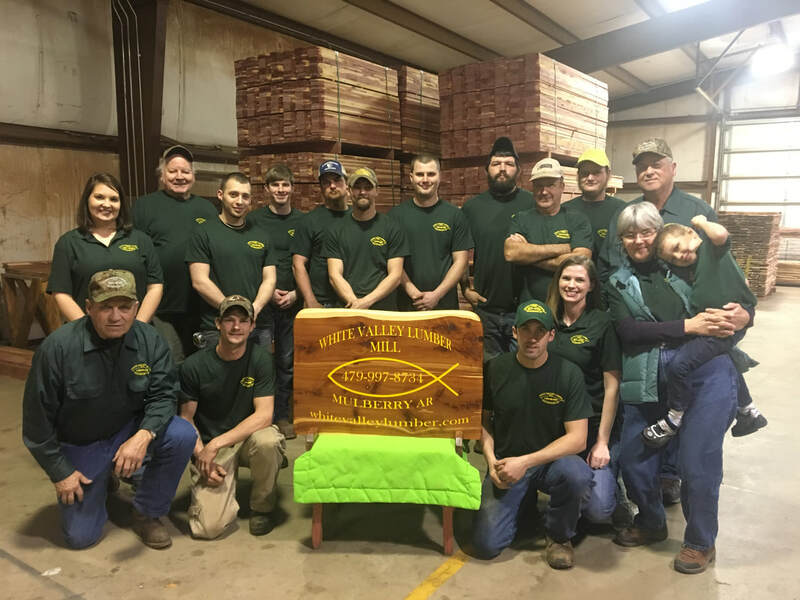 Jordan is John’s youngest son, also from Northern Wisconsin and recently moved to Arkansas with his wife, Alexa Volkmann, and their son, Liam, to work at the lumber mill. Jordan helps his dad run the lumber mill crew, can run either head saw and manages the shop. When he isn’t working, he loves spending time with his family, hunting, fishing, bike riding and relaxing on the beach. Alexa has lived in many places but prefers the south and was happy to move from Wisconsin to Arkansas with Jordan. Alexa works in the office and wears many hats at White Valley Lumber Mill, from secretary to human resources. In her free time, she enjoys running, bike riding and relaxing on the beach. When he's not in school Liam is working hard in the office and out in the yard. He's definitely a boss in training. He enjoys rock collecting, bike riding and like all little boys cars and trucks. The newest member of the family. So far she likes her naps, running around the office and smiling at the customers.